Hey all! 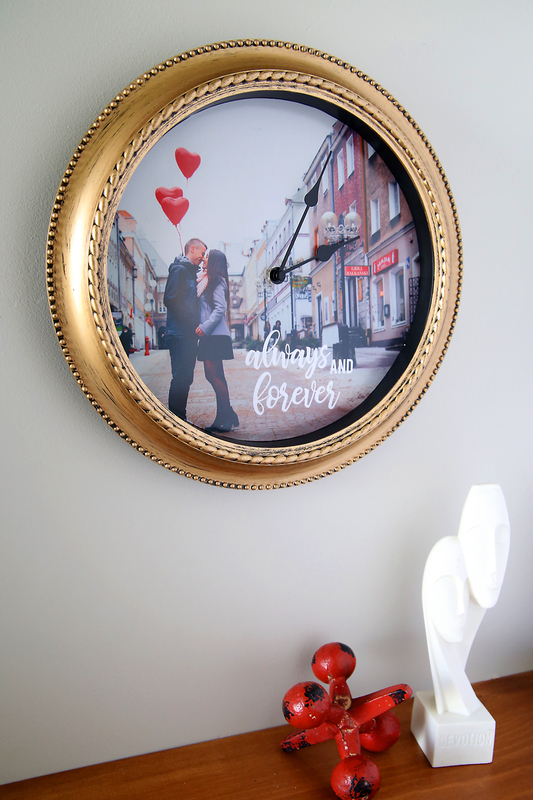 Today I’m sharing a fun and easy project: a DIY personalized photo clock. 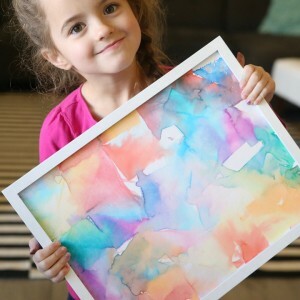 This simple project comes together quickly and inexpensively and is a great way to showcase one of your favorite photos. 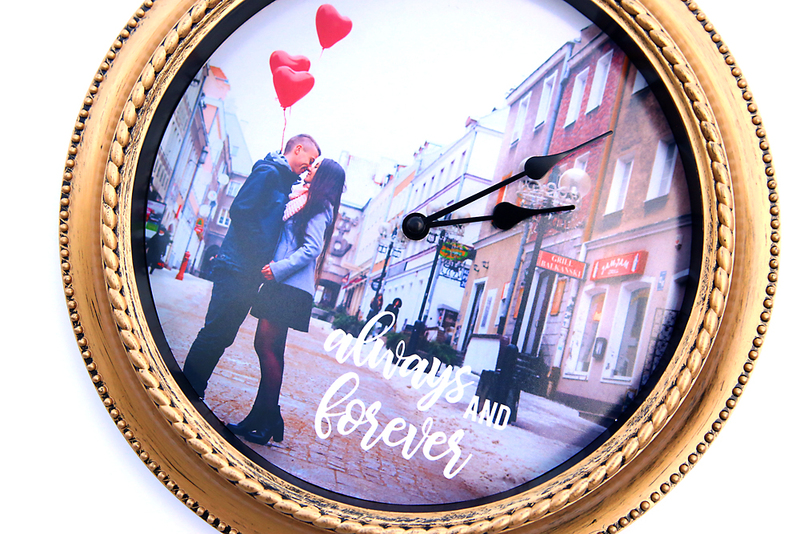 It would make a great gift for a wedding or anniversary! 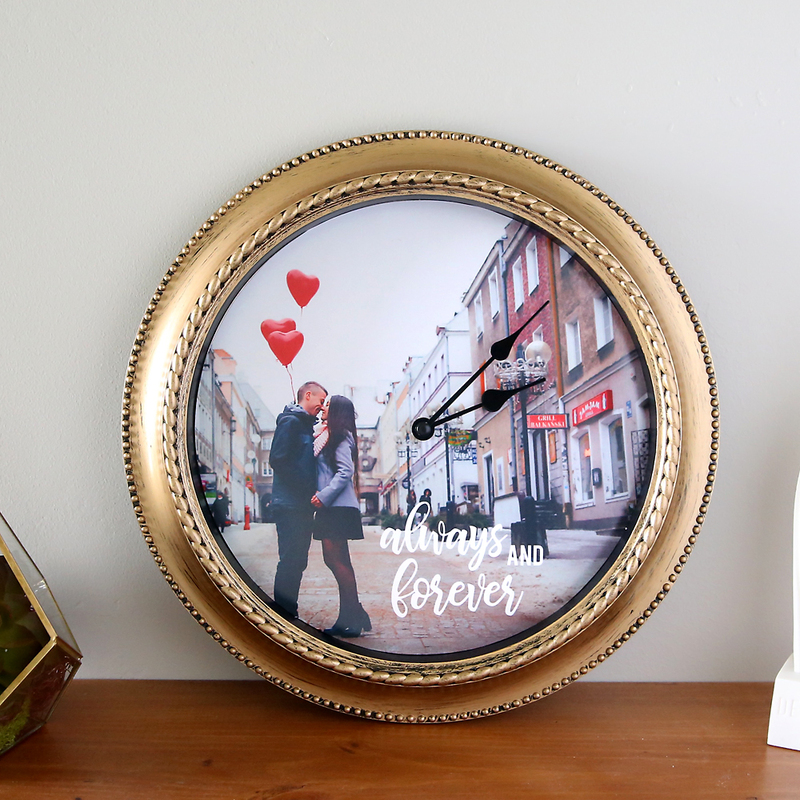 I’m going to show you how to add text to a photo using my go-to photo editing software, Adobe Photoshop Elements 15, and then I’ll show you how to use that photo to transform an ordinary clock into something gorgeous. Thank you to Adobe for sponsoring this post. 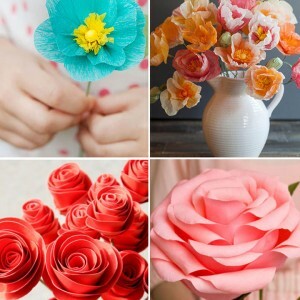 Click here for even more DIY photo projects! I’m excited to make a clock like this with a photo of my own family as soon as we get family photos taken later this month (wish me luck finding coordinating outfits for seven people!). I found the clock at Walmart and I think it’s quite pretty, especially considering it only cost $10. Add in a few dollars for the photo print, and this whole project costs less than fifteen bucks. 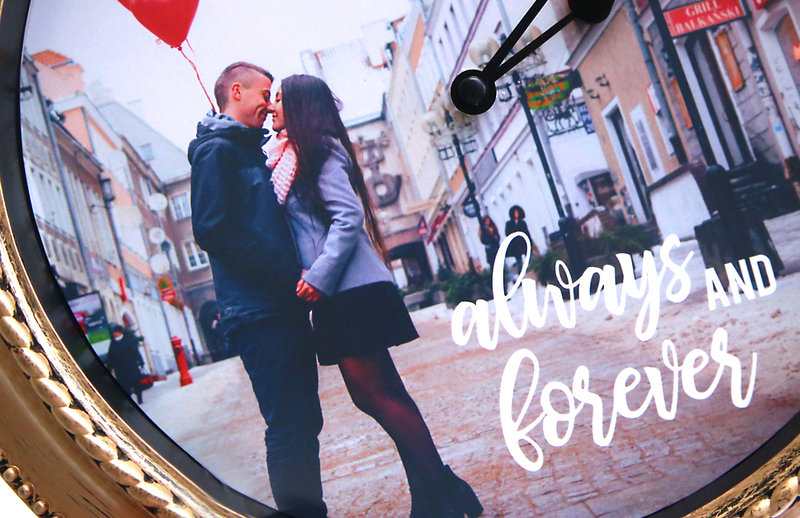 After you add text to your photo, you’ll want to crop it in a circle and make sure it’s the same size as your clock face (the video above shows you how to do this). 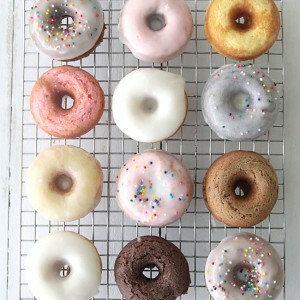 1 – Begin with a clock and a photo that’s cropped into a circle the same size as the clock face. Carefully cut out the photo. 2 – Find the center of the photo and mark it. Make a small X with an exacto knife on the center mark. 3 – Unscrew the back of the clock so you can remove the protective glass. 4 – Remove the clock hands. Place the photo down onto the clock face, allowing the mechanism that holds the clock hands to come through the X you cut in the center of your photo. Use an exacto knife to trim a hole in the middle of the photo so it can lay flat against the clock face. 5 – Adhere the photo to the clock face. Replace the hands and screw the clock back together. 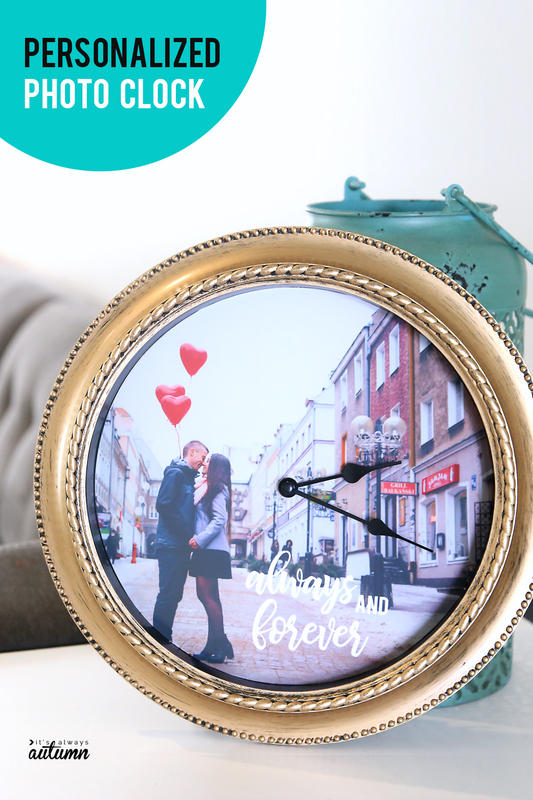 Your DIY personalized photo clock is done! Fun, right? I think this project would make a beautiful gift. It would be pretty cool with a giant clock and photo! If you’d like to try adding text to some of your photos, click here to try Photoshop Elements free for 30 days. 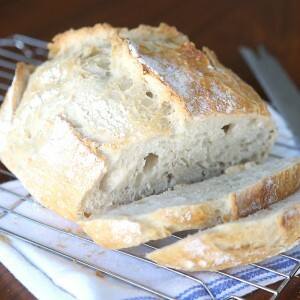 You’ll love it! 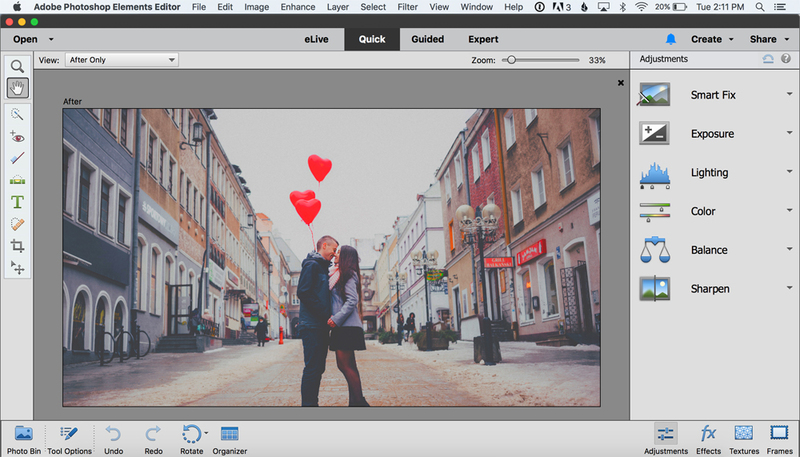 I use Photoshop Elements almost every day, between creating photo projects, editing photos for my blog, and making my personal photos look their best. Click here to see all my other Photoshop Elements tutorials. Such a fun idea! My daughter recently got married.and I am looking for ways to surprise her with wedding photos…this is just perfect. I can’t wait to get started! Thanks so much for posting. What do you print the photo onto? Normal paper, or something else? did you ever get a response to this question because I would love to know the answer. What kind of paper should i print this on? normal or something else? Yes, I just used plain paper!